President Trump stands on the podium in Singapore with his arms outstretched and answers a final question from reporters. Back in the U.S., he was flexing his muscles in GOP primaries. 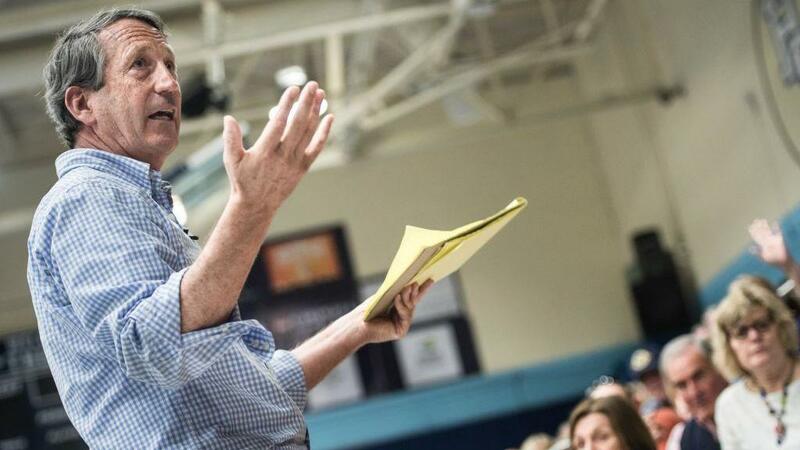 Rep. Mark Sanford, R-S.C., addresses the crowd during a town hall meeting in Hilton Head, S.C., in March 2017. In South Carolina Tuesday night, a GOP congressman who has criticized the president — and drew a stinging rebuke from Trump just hours before polls closed — lost his first election in more than two decades. 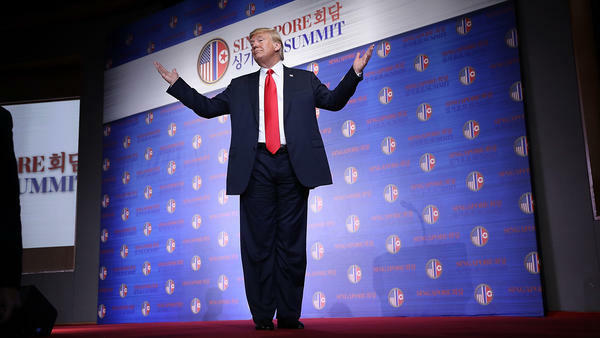 Trump tweeted his criticism of Mark Sanford — and a series of other insults, including against actor Robert DeNiro, who blasted Trump at the Tony Awards on Sunday night — on the long flight back to the U.S. from Singapore, where he met with North Korea's Kim Jong Un. In Virginia, a controversial Trump acolyte will be his party's Senate candidate this fall, and in a key Northern Virginia swing district, a GOP congresswoman, who criticized Trump after the Access Hollywood tape was released, underperformed in her primary against a nominal opponent. Criticizing Trump has become hazardous for Republican elected officials. Rep. Mark Sanford, R-S.C., despite being a member of the conservative Freedom Caucus and a Club for Growth favorite, on Tuesday became just the second incumbent to lose renomination this year. His loss followed last week's Alabama primary, which saw another GOP incumbent, Rep. Martha Roby, forced into a runoff because of her criticism of Trump, also after the Access Hollywood tape surfaced. And other Republicans who have criticized the president, like Arizona Sen. Jeff Flake and Tennessee Sen. Bob Corker, retired rather than face primary voters. Corker's effort to put a check on President Trump's ability to issue tariffs against allies was also rebuffed, and the House sidelined an immigration bill that Trump wouldn't support. The message is clear, as NPR's Susan Davis notes: Trump is in charge, and Republicans in Congress have zero willingness — or political self-interest — to push back against him on virtually any issue. The energy on the Republican side in 2018 is with those who side with Trump. As conservative writer Erick Erickson noted, "[T]he GOP is not really a conservative party that cares about limited government. It is now fully a cult of personality." At the same time, on the Democratic side, women continue to be in the driver's seat. Democratic women swept their party's nominations in several Virginia congressional contests key to their party's hopes of retaking the House. It continues the other major trend this midterm cycle — of Democratic women running and winning as they aim to lead the resistance to Trump and are on a collision course with his base this fall. There were also some contests that highlighted the liberal versus moderate divide that is bubbling beneath the surface in some Democratic primary races this year as well. In GOP primaries, race to be the most "Trumpian"
Sanford's opponent, state Rep. Katie Arrington, made his vocal opposition to Trump the central tenet of her campaign, and Trump tweeted out that Sanford was "nothing but trouble" and should lose his race. The backlash Sanford faced at the ballot box shows why so many lawmakers are hesitant to cross the president for fear of retribution. Sanford was able to survive a major scandal— famously disappearing from the state in 2009 when he was governor, claiming to have been hiking the Appalachian Trail, when in fact he was carrying on an extramarital affair in Argentina. He was censured by South Carolina's Legislature but served out his term and won a special election to the House in 2013. It was Sanford's opposition to Trump that ultimately was his downfall. Arrington, who partially self-funded her campaign, argued she would be a better team player for the president than Sanford has been. Even before The Associated Press called the race for Arrington, Sanford conceded Tuesday night, admitting that the math wasn't there for him to win. Trump endorsed Arrington in a tweet on Tuesday afternoon, less than three hours before the polls closed at 7 p.m. The South Carolina race for governor also featured a Trump loyalist, Gov. Henry McMaster, but he was unable to avoid a runoff. McMaster got the job after Trump chose then-Gov. Nikki Haley to be ambassador to the United Nations. He was the first statewide elected official to endorse Trump early in the primary season. Trump repaid that loyalty over the weekend with a tweet lavishing praise on McMaster. Now, McMaster will face wealthy mortgage company executive and Iraq War veteran John Warren, who is largely self-funding his campaign, in the June 26 runoff. Warren surged in the final weeks of the race to edge out Catherine Templeton, a former member of Haley's Cabinet, for the No. 2 position in the race and the runoff slot. In Virginia, outspoken Trump loyalist Corey Stewart narrowly won the GOP nomination for U.S. Senate, likely to the chagrin of many national Republicans. Stewart is a far-right provocateur who nearly claimed the nomination for governor last year and has attracted controversy for his defense of Confederate statues. Stewart edged out state Delegate Nick Freitas, who had the support of most establishment Republicans in the state. Former Virginia Lt. Gov. Bill Bolling, one of the last Republicans to win statewide, bemoaned Stewart's nomination on Twitter. Stewart's nomination in the bitter Senate primary contest to face Democratic Sen. Tim Kaine could further the GOP's fall in Virginia in recent years, where Republicans have failed to win a statewide contest since 2009. The commonwealth has gotten bluer, but the GOP has only moved further to the right there. There's a real possibility now that with the divisive Stewart atop the ticket, he could be a drag on down-ballot candidates in Virginia, where several GOP-held House districts are important in Democratic hopes of taking back Congress. A state that avoided a bitter intraparty fight is Nevada, where Danny Tarkanian had been angling to challenge GOP Sen. Dean Heller, a onetime Trump foe. As the only GOP senator running for re-election in a state that Hillary Clinton won in 2016, Heller is considered the most endangered Republican incumbent this year. The White House persuaded Tarkanian, a frequent candidate and son of a famed basketball coach in the state, to run for an open House contest instead. Heller easily won his primary and will now face Rep. Jacky Rosen, who claimed the Democratic nomination for Senate Tuesday. Their race will be one of the most competitive of the 2018 cycle. Tarkanian's decision to run in the 3rd Congressional District paid off for him, even though the general election may be tougher now for Republicans given Tarkanian's losing track record and more conservative credentials. Elsewhere in Nevada, moderate GOP Rep. Mark Amodei defeated Tea Party challenger Sharron Angle for the 2nd Congressional District. Democratic women won their party's nominations in two competitive Republican-held congressional districts in Virginia. More than half the women who have run in Democratic House primaries have won this year, according to Rutgers University's Center for American Women and Politics. GOP Rep. Barbara Comstock, who represents the D.C. suburbs and exurbs in Virginia, is one of the most vulnerable incumbents in the country, representing a district that Trump lost by 10 points. State Sen. Jennifer Wexton, who had the endorsements of many of the state's Democratic officials including Gov. Ralph Northam, won the six-way Democratic primary convincingly. Meanwhile, Comstock underwhelmed in her primary, taking only about 60 percent of the vote against a challenger endorsed by former Trump aide Seb Gorka. Former CIA operative Abigail Spanberger easily won the Democratic nomination to challenge GOP Rep. Dave Brat in the increasingly competitive 7th District in the Richmond suburbs. In an interview with the The Washington Post, her challenger, retired Marine Dan Ward, even complained that Spanberger has gotten more favorable treatment because she was running in the "year of the woman." Brat, who shocked Washington by knocking off then-House Majority Leader Eric Cantor in a primary four years ago, is an incumbent that Republican strategists are increasingly worried about. The Democratic Party has seen some intraparty fights this year between liberals and moderates, and that happened again in the race for Nevada governor. Clark County Commissioner Steve Sisolak won the Democratic nomination, running as a centrist along with the backing of former Senate Majority Leader Harry Reid's considerable political machine. His fellow commissioner Chris Giunchigliani presented herself as the liberal alternative, but it wasn't enough. As The New York Times recently pointed out, women running for governor haven't gotten the same boost as female federal candidates this year. Attorney General Adam Laxalt won the Republican nomination for Nevada governor, and Trump also tweeted out his support for Laxalt as people were voting Tuesday afternoon. Maine Attorney General Janet Mills could make a breakthrough for women in her state's governor's race, but the outcome may not be clear immediately. The state is trying ranked voting for the first time — but voters are also being asked whether they want to keep that system in place. Mills is one of several Democrats running in the open contest, a key pickup opportunity for Democrats. Most of the Republicans ran in the mold of firebrand conservative GOP Gov. Paul LePage, who is term-limited. Republican auto-repair company owner Shawn Moody won his party's gubernatorial primary. Because of the new ranked voting, his Democratic challenger is not yet known. In South Carolina, Archie Parnell won the Democratic nomination for a House seat despite revelations that he abused his wife four decades ago. Parnell ignored calls from Democratic officials including the party's chair who asked him to step out of the race. He will face a rematch with GOP Rep. Ralph Norman, who defeated Parnell by 3 percentage points in a special election last year to replace Mick Mulvaney, who was appointed to direct the Office of Management and Budget. And in Nevada's open 4th Congressional District, where Democratic Rep. Ruben Kihuen has decided not to run again after sexual harassment allegations, former Rep. Steven Horsford claimed the Democratic nomination over several more progressive challengers in the primary. Former Rep. Cresent Hardy won the Republican nomination, setting up a rematch with Horsford; Hardy beat Horsford in 2014, but lost two years later to Kihuen. Dennis Hof, who is the owner of several legal brothels in Nevada, defeated incumbent Republican state lawmaker Jamese Oscarson. Daniella Cheslow and Domenico Montanaro contributed to this story from Washington.